Very disappointing result and sounds like most of the team decided not to turn up. Where was Reece Brown today, I didn't hear him mention by the Manager, roll on January and some replacements. Lets enjoy Christmas instead and hope all you Rovers have a good time. Men against boys 0-1 flattered us! Not a shot on goal, best team available to MC and still awful, not players fault, they just ain’t good enough, pretty simple I am afraid, 5 signings won’t be enough, good job other clubs in our mini league look as bad!! Cooper applauded us today, the signs of a man on the verge? Gotta to be a transfer window of utter inspiration to survive his tenure for me. I think I lost a lot of faith when we were 1-0 up and a man up at Exeter in the FA Cup and for a passage of play looked afraid to play forward and in to the box. I just think we are too predictable and slow. Possession is fine, but Barca and PSG etc all play forward as their first thought. We allow teams time to get in formation and settled and hard to break down. Weve had too many games where we "have played really well" but still lost. We are half way through the season now and from what I've seen we probably deserve to be where we are. We had no shots on target today and that falls in line with our stats over 23 games i.e. we don't produce enough. This January will offer a very difficult transfer window given our position, certainly the most difficult of Cooper's tenure. I havent seen enough from what he had done to be confident that all of his signings will come good and that concerns me. It's not time to panic, but it is time to ask serious questions. A lot of people seem to think relegation will be fine as Dale will fund another promotion, but the VNL is getting more competitive by the year and going down shouldn't be considered an option. doggy wrote: Men against boys 0-1 flattered us! Not a shot on goal, best team available to MC and still awful, not players fault, they just ain’t good enough, pretty simple I am afraid, 5 signings won’t be enough, good job other clubs in our mini league look as bad!! Cooper applauded us today, the signs of a man on the verge? Gotta to be a transfer window of utter inspiration to survive his tenure for me. Wrong doggy, where was Brown, Monthe, Ivacovitti all influential players missing today. I'm not saying the game was good, far from it by the commentary and the players on should have done a lot better. We don't appear to be able to defend from set pieces, or convert set pieces. We don't seem to be able to press the opposition, and go for the goal. We are however, very good at kicking the ball around until we pass it back to Brad or one of the opposition. Is it a coincidence that our form has dropped with the return of a certain injured player? Lots of questions to consider over Christmas. Best team AVAILABLE LM ... Lacovetti, Brown injured, Monthe? ..Brown has been too lightweight anyway,Lacovetti not always first choice and Manny banned!! Maybe you are wrong....again? The time has come. Cooper must go tonight. If DV was there today he would have witnessed a soulless half-hearted display by a team who are not playing for their manager. Collins is the only one with leadership, Osborne the only one who can tackle and Stevens the only one with heart. Problem is, if DV wasn’t there he would think only losing 1-0 is a not too bad result, when 6-0 would have not flattered Carlisle. Even with a juicy contract DV must rip it up and start again. I was a big fan of Coops especially after being such a great FGR player. Just wish he would walk away now. The team is rudderless, Kmb just walking around the pitch with no care at all. Even subs, bar Stevens don’t look up for it when they come on. 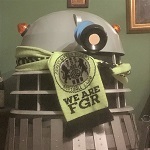 Very sad time to be a loyal FGR supporter. Highlight of game, Dale Bennett knocking photographer Shane Healey off his perch! Reminded me of the time Lee Hughes took out the Citizen snapper! Last edited by SNJ Ash on Sat Dec 23, 2017 9:15 pm, edited 2 times in total. We're lacking creativity due to having to hold the midfield back to protect a poor defence with no confidence in their goalkeeper. The wingers struggle without support from overlapping fullbacks who are usually pinned back due again to the poor defence being unable to cope. Without Brown, Doidge is then left isolated with no service, and even with Brown there the service is patchy at best. I would say play 3 attacking midfielders with KMB and James out wide and Brown playing closer to Doidge, but frankly James is pants. This also leaves the problem of less cover for the defence, as it leaves a lot of pressure on Ozzy and Drissa to link the play forward and protect the defence and as soon as they arent on top form we struggle, and frankly even if they are on form the defence still struggles. We need a new goalkeeper, leading centre back, competition at right back, central midfield cover and a left winger in January if Cooper's style of play has a chance of working. Right now we're rubbish right across the pitch. I love good attacking possession based football and I fully believe its the way to go for this squad, but that style requires on solidity at the back and in central midfield first to control games, as well as trusting the defence enough to be able to throw men forward in order to threaten as we're usually up against organised defences rather than rapid counter-attacking breaks. Today was one of the most gutless, pathetic and inept performances I have witnessed from an FGR team!! I have tried to stay positive, and through the last matches that were defeats, could see some positives. Absolutely none today! Today was the last straw for me, I cannot see us surviving withe Cooper in charge! Vince needs to grow a pair and get rid now, because I would not trust Cooper with my cash in the Jan Window!!! Over 2,000 home fans again today, our brilliant club deserves better!!! "This is painful - do they actually want to score?" Hard to know what to say after that. Even when we managed to lose at home to North Ferriby last season there was marginally more effort than we saw today. Collins (L) Fitzy and Ozzy & to some extent Stevens showed some heart but gutless from everyone else. Clearly not many taking up Cooper's challenge of showing them they have earned their place before he starts shopping in the January sales. Whitminster lads following "Non ita parva clava in colle"
MC must be very concerned about his own position let alone finding new player's. Very disappointing performance, especially considering we looked stronger on paper. Positives few, but credit to Fitzwalter for his last ditch saves, Ozzy for his commitment and Lee Collins for leading from the back. Stevens should have started! Crowd was very healthy, shame there was little for them to celebtrate. "Best team AVAILABLE LM ... Lacovetti, Brown injured, Monthe? ..Brown has been too lightweight anyway,Lacovetti not always first choice and Manny banned!! Maybe you are wrong....again?" Well he's not likely to put out his worse team available doggie so it was a pointless sentence wasn't it. Didn't make it down today. I spent some time with the family. Cooking and hoping. Not good today. The only positive is IO is back. But he is no miracle worker. A pint at the social network isn't making it any brighter.